The ring is on the finger, the date is set, everyone is excited, and the planning is about to begin. It is time for everyone to meet and get to know their new extended families. There are so many decisions to be made and shared, and what better way than over a nice dinner? Either family or even the engaged couple may host the dinner. The bride-to-be and her mother might enjoy planning and preparing the meal together, sharing some wonderful girl time. 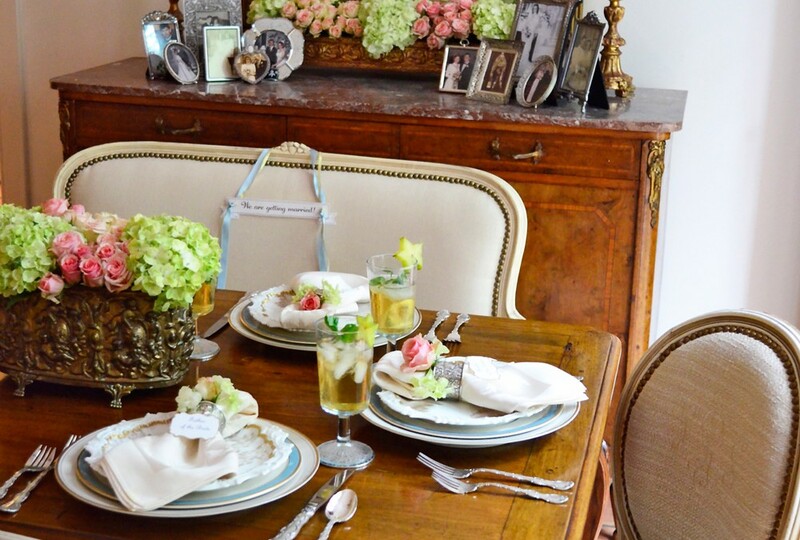 Set an intimate table with fine china, silver, crystal, fine linens, and beautiful low fresh flower arrangements. A few details will make the evening special and memorable. Set a romantic mood by placing framed wedding photos of parents, grandparents, aunts, and uncles on a sideboard among fresh flowers. A settee with a “We are getting married!” banner on the back is the perfect place for the newly engaged couple to enjoy the dinner. Just for fun, use “Bride,” “Groom,” “Mother of the Bride,” “Mother of the Groom,” Father of the Bride,” and “Father of the Groom” as place cards. Begin the meal with a salad with fruits. Serve an entree of pork tenderloin with vegetables of fresh greens, and a decadent dessert with coffee, and let the ideas and planning begin! Pork Tenderloin, Twice-Baked Potatoes, and Baked Broccoli are highlights of the menu. Add flowers and a place card to each setting to honor guests. Make the couple feel special with this chair marker. In a saucepan over medium heat, sauté almonds in butter; set aside. To serve, place greens on six plates. Sprinkle each salad with berries and almonds. Garnish each with a few whole strawberries. Drizzle salads with vinaigrette. Sprinkle both sides of tenderloins with salt and pepper. Combine remaining ingredients, and pour over pork in a 9 x 13-inch glass baking dish. Marinate in refrigerator for 2 hours. Remove and bring to room temperature for 30 minutes. Bake in a preheated 400-degree oven for 20 to 25 minutes. Let rest for 10 to 15 minutes. Slice and serve with pan sauce. Preheat oven to 400 degrees. Poke each potato in several places with fork tines. Rub potatoes with olive oil. Place on middle rack in oven, and bake 1 hour and 15 minutes. Allow potatoes to cool to touch. Slice the top third of each potato off lengthwise. Scoop out insides leaving about ¼ inch of potato on the skin of each potato, and set aside. Discard top third sections when scooped out. In a large bowl, place scooped-out potatoes, butter, cream, sour cream, onions, ¾ cup cheese, bacon, salt, and pepper. Mash with potato masher until combined and creamy. Place mixture into potato jackets and sprinkle with cheese. Heat in preheated 350-degree oven for 15 to 20 minutes. Preheat oven to 325 degrees. Place broccoli on foil-lined baking pan. Drizzle with 5 tablespoons olive oil, and sprinkle with salt and pepper. Bake for 20 to 25 minutes until crisp-tender and a few florets are a little brown on edges. Remove from oven and drizzle with remaining olive oil. Sprinkle with lemon zest and juice and cheese. Preheat oven to 350 degrees. Line bottom of a greased 9-inch springform pan with parchment paper; grease paper. In microwave on defrost, melt chocolate and butter until smooth. Cool slightly. With mixer, beat eggs until frothy; gradually add sugar. Beat on medium for 4-5 minutes until mixture triples in volume. Slowly beat in chocolate mixture and vanilla. Fold in flour. Bake for 30 to 35 minutes or until toothpick comes out clean when inserted in center. Cool on wire rack. Run knife around rim of pan and remove cake to wire rack to cool completely. Top with Ganache. Place chocolate in a bowl. In a saucepan over medium heat, bring cream to a boil. Pour over chocolate; whisk until smooth. Stir in butter. Chill for 15 minutes. In a medium saucepan over low heat, stir together strawberries, sugar, water, and lemon juice. Heat for 5 minutes. Cool, and serve at room temperature. Beat cream until soft peaks begin to form. Gradually beat in sugar. Chill.